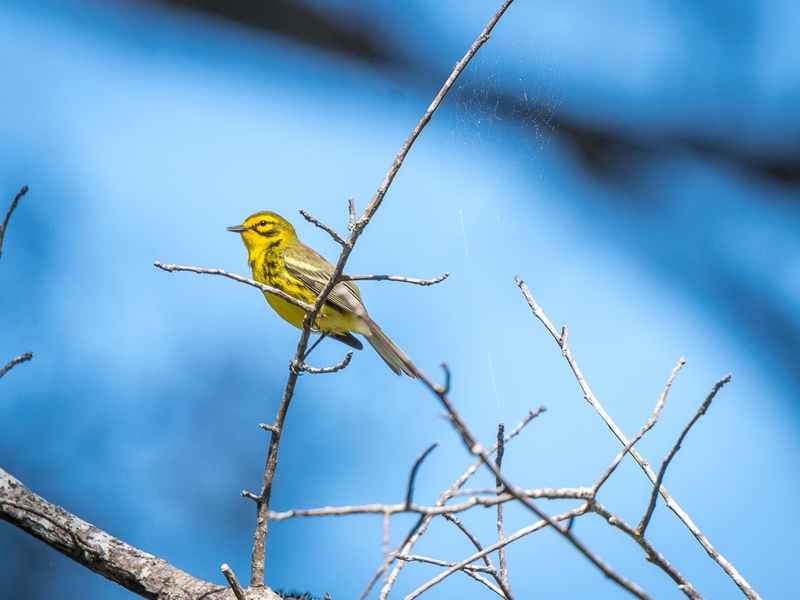 Our group of 15 birders met at Lawson Creek Park in New Bern, NC, on Friday, April 27. Right after a picnic and group meeting, we headed south on 70 to Catfish Lake Road. This road led us into the heart of the beautiful Croatan National Forest where we saw our first of several small “groups” of Red-cockaded Woodpeckers. 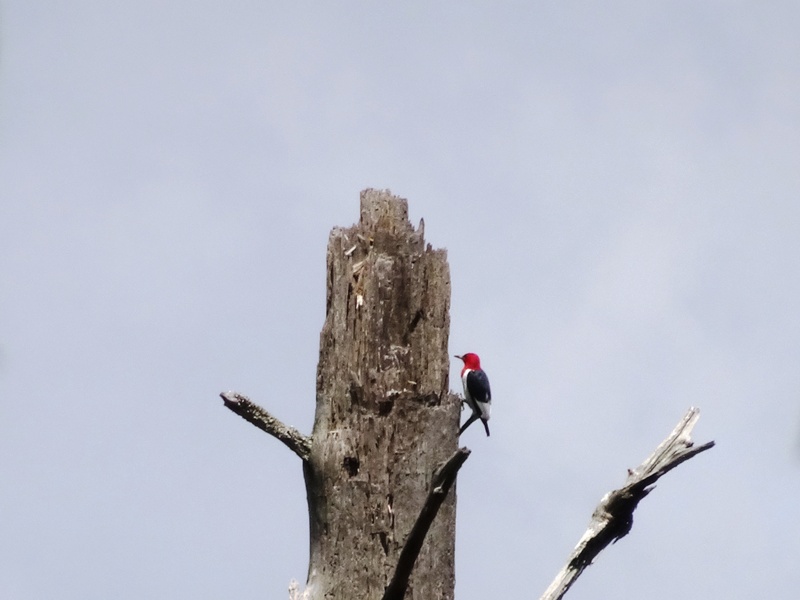 However, the star of the first stop was this Red-headed Woodpecker who posed on the top of a dead snag for all to enjoy. We enjoyed hearing a Prairie Warbler at this stop and we were thrilled to see and hear many more throughout the trip. We also enjoyed seeing a Blue-gray Gnatcatcher pair tending to their nest. Next we headed to Pringle Road in the southern part of this forest. We spent the rest of the afternoon driving and stopping in our search for Bachman’s Sparrow. We learned that the proper pronunciation of the name is “back” man’s sparrow. 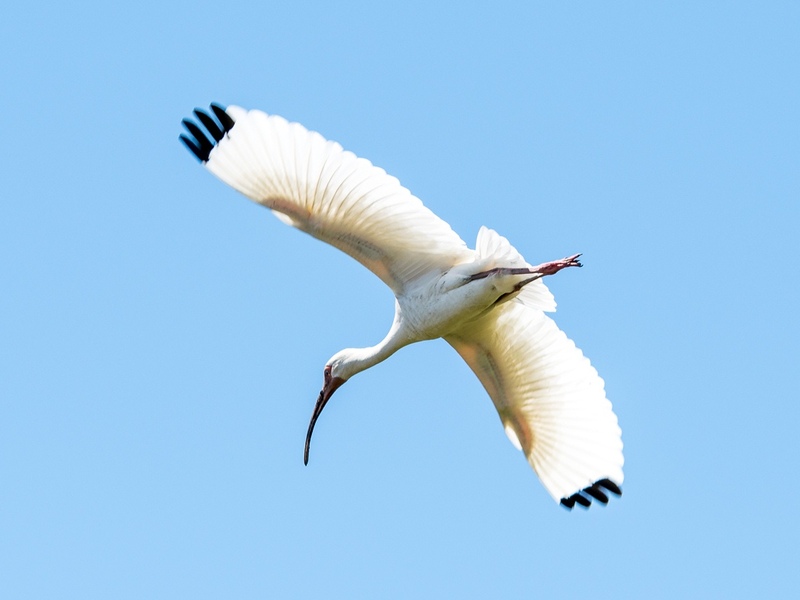 Audubon named this bird after a friend and fellow naturalist. 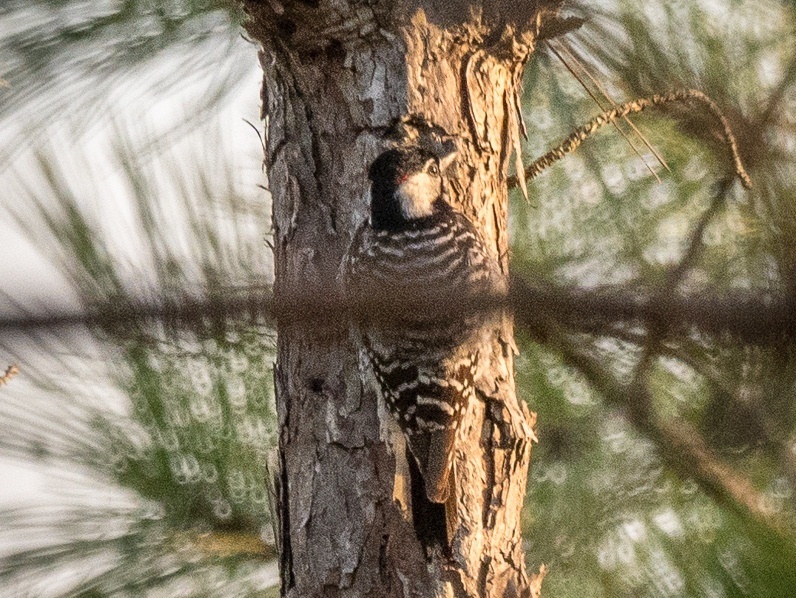 We heard many of them singing on the northward trip up Pringle Road, but did not actually see one until the end of the day on our return south where we got great looks at several. Their beautiful evening song won’t be forgotten! 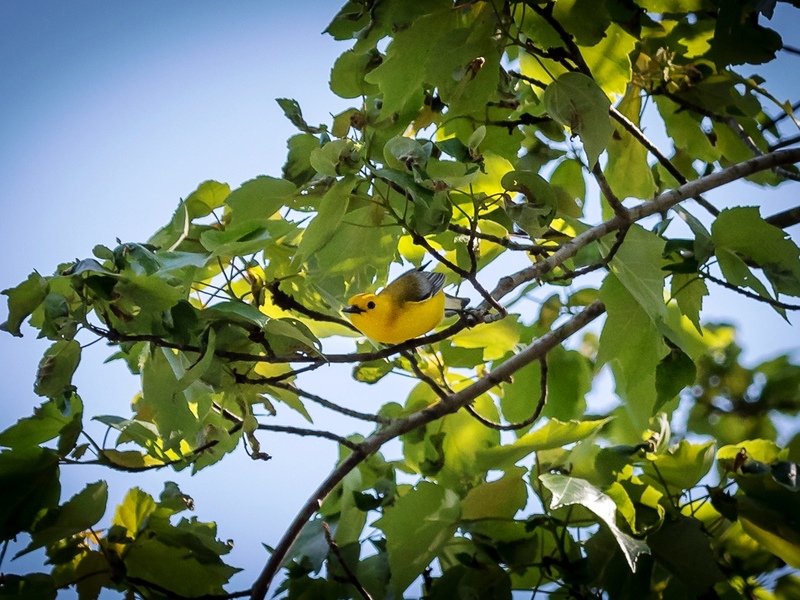 The deep yellow of the Prothonotary Warbler is hard to capture, but Paul Beerman got a great photo of this beauty! On Saturday, we got up very early! Breakfast was ready for us by 4:30 AM. We left the hotel around 5:00 AM and made it to the Cedar Island Causeway in time to enjoy sunrise over the marshland. 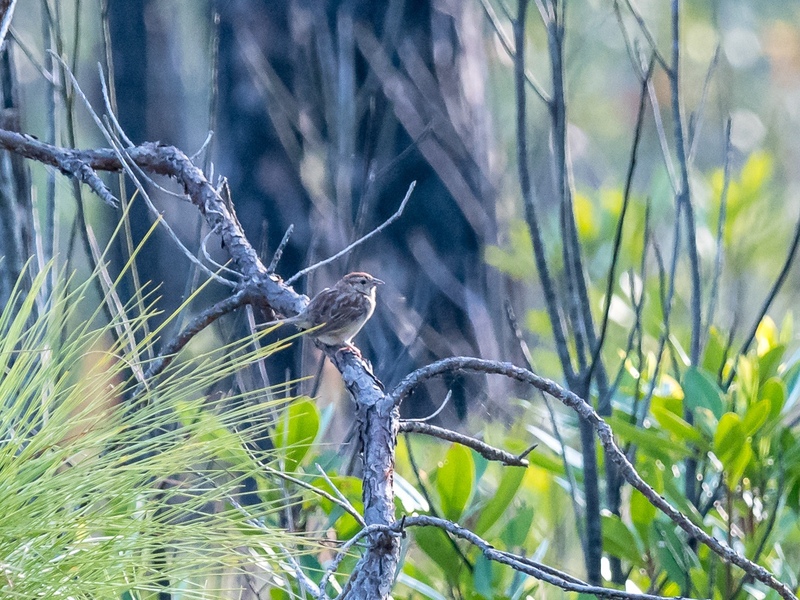 We pulled to the side of the road at multiple spots and heard Clapper Rails, Sora, and multiple Seaside Sparrows welcoming the new day. 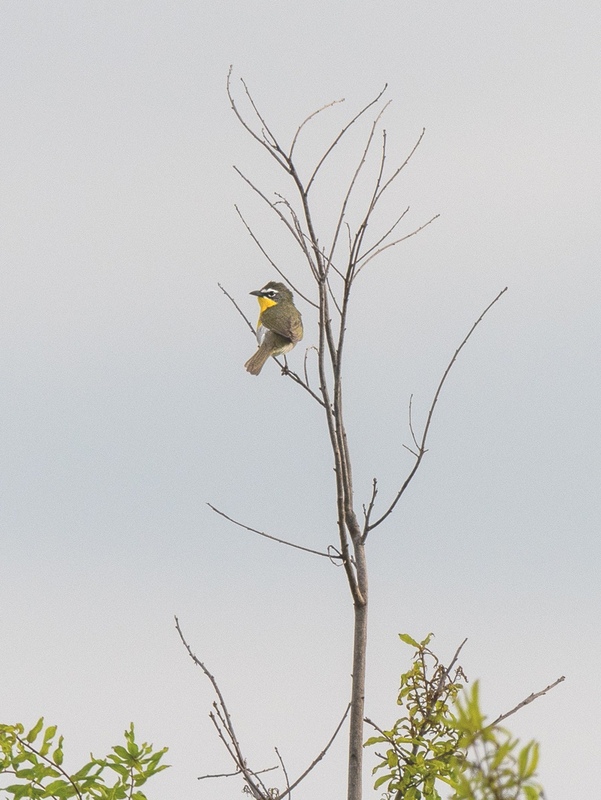 Several Green Herons were seen over the marsh. After this, we went to the Cedar Island Ferry Terminal boat ramp and enjoyed a study of sandpipers. A one-legged Black-bellied Plover was spotted. Sometimes shorebirds tuck one leg up for a rest, but this bird truly only had one leg which he strategically placed directly under his belly. A fortunate few also got looks at a Swallow-tailed Kite and Gull-billed Tern. Brown Pelicans soared overhead in large groups. As we walked down the beach, we added Least Sandpiper, Dunlin, Red-breasted Merganser, and Ruddy Turnstone. 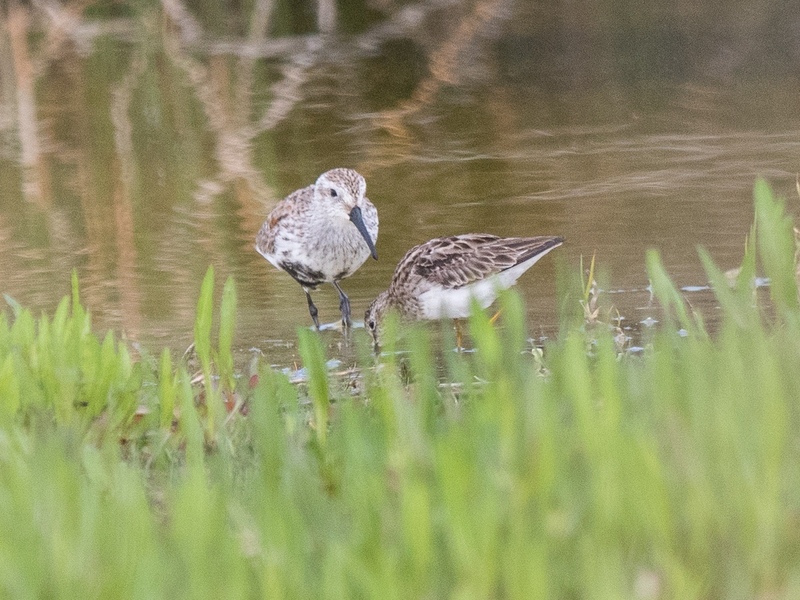 Dunlin and Least Sandpiper – side by side for a good comparison. The bird of the day was the Common Eider that had been seen of late around the ferry terminal. Again, another life bird for many of the participants. After eating lunch, we drove to Fort Macon State Park. Our favorite bird here was the Painted Bunting at the fort’s feeders. 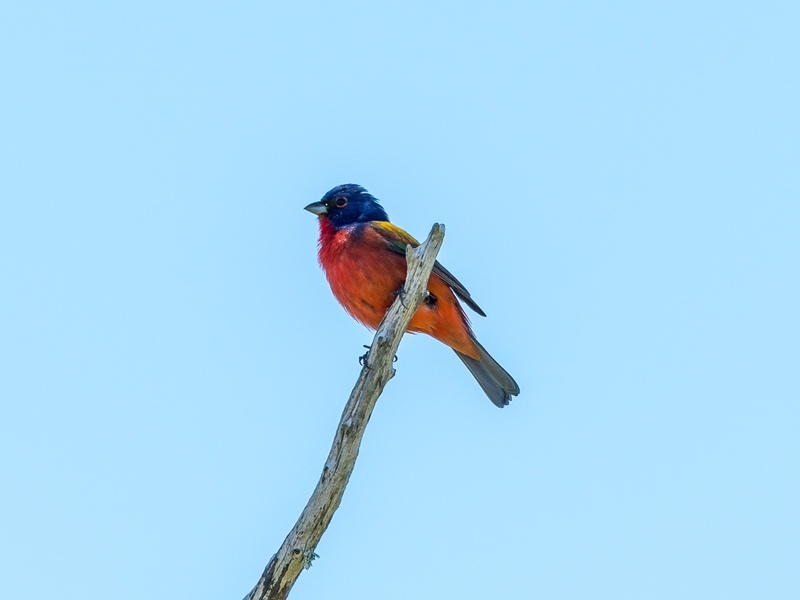 Painted Bunting at Fort Macon. 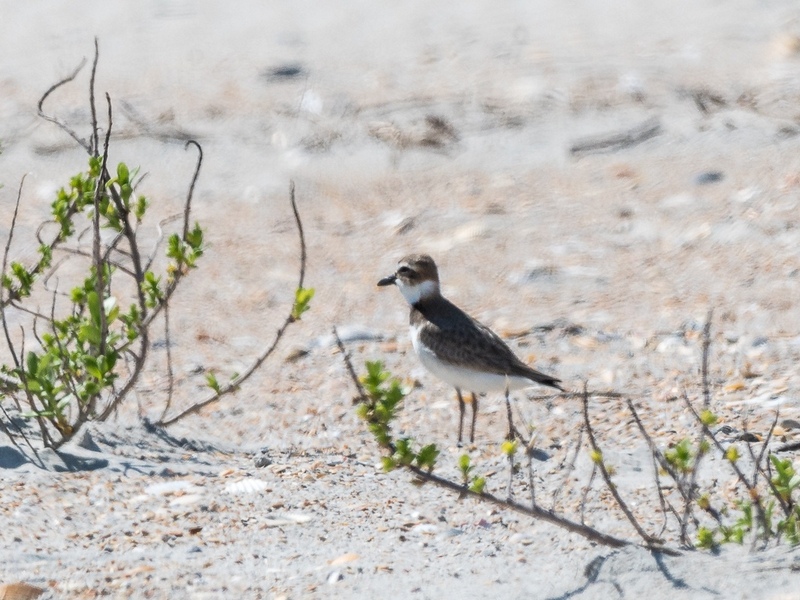 One of our target birds was Wilson’s Plover – a life bird for many on the trip! After a delicious dinner at Amos Mosquito’s, we had the traditional countdown of all birds we saw on the trip. The total at that point was 102 species with several more to be added the next day! A scoop of ice cream was the finishing touch to a wonderful day. Again, morning came early! By 6:30 AM, we were at our meeting place in the parking lot of North River Wetland Preserve just a bit east of Otway. John Fussell and several of his friends escorted us into this beautiful preserve. For a small fee, visitors may enter on foot or bicycle. We were privileged to accompany John and tour the wetland reconstruction project by car! Semipalmated and Least Sandpipers were foraging in a newly constructed “swamp” in which 30 volunteers had planted thousands of stalks of “swamp” grass. 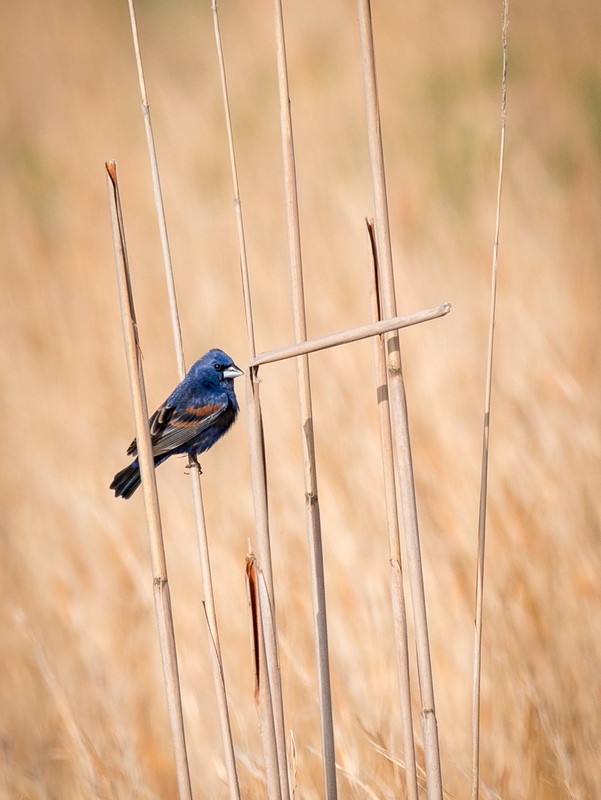 Yellow-breasted Chats and Blue Grosbeaks live at the North River Wetland Preserve. More life birds were added to many lists when we heard and saw the King Rail. Eighteen more birds were added according to John Hammond’s official list. His total was now 115 species for the trip!! 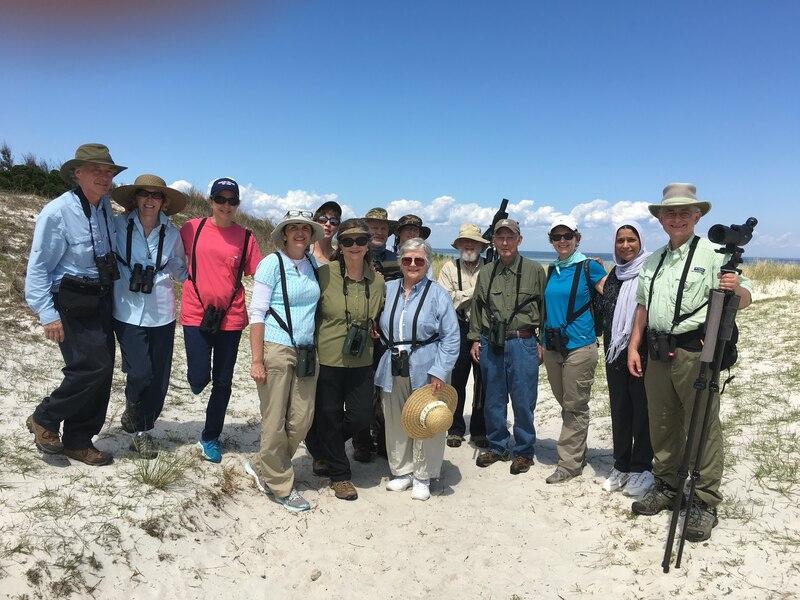 A great time was had by each of these wonderful, intrepid birders! Special thanks to the photographers for the use of their photos in this post.